What’s Driving Forest Industry Growth in the US South? 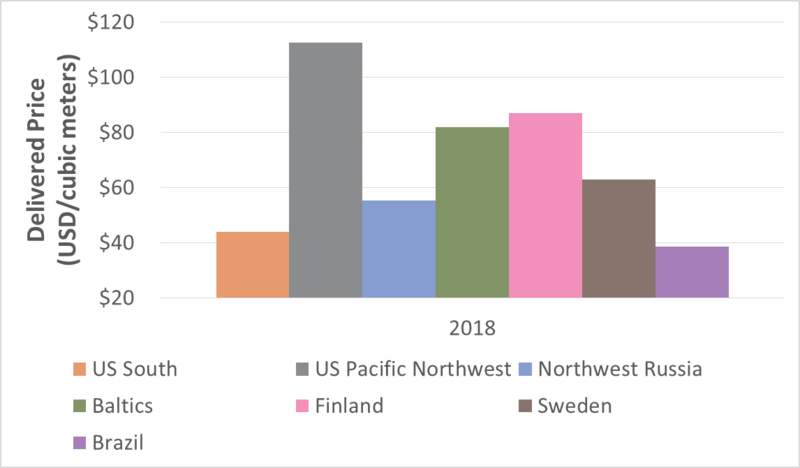 As I wrote in the first installment of this blog series, it’s nearly impossible to overstate the impacts that the Great Recession of 2008 had on the North American forest products industry. The sudden plunge of the housing sector had cascading effects that immediately influenced the entire global economy. 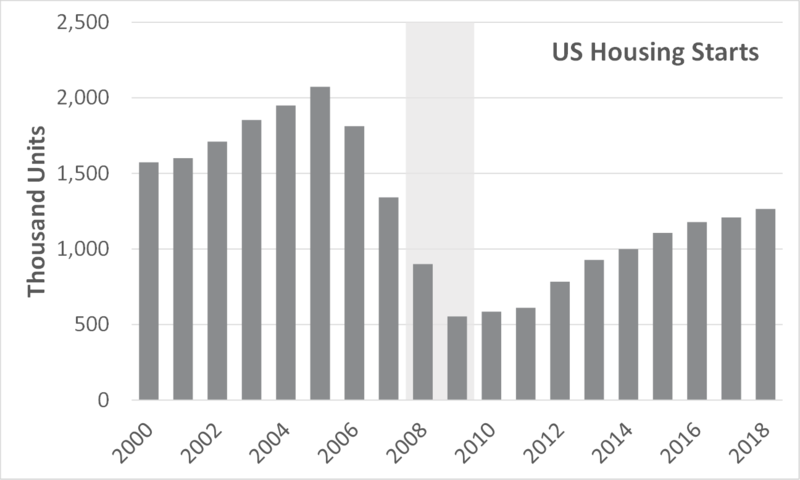 If we’re being honest, most of us would admit that we thought housing starts would have returned to 1.5 million units (our historic average) by the year 2011-2012… maybe 2013 at the latest. But unfortunately—even in the wake of some unprecedented economic growth and record setting DJIA performance since 2016—we still haven’t returned to that level, and we don’t think it will be realistically attainable before 2023 at the earliest. Since the low point in 2009, we have seen the housing market begin to recover and lumber demand has increased with it. 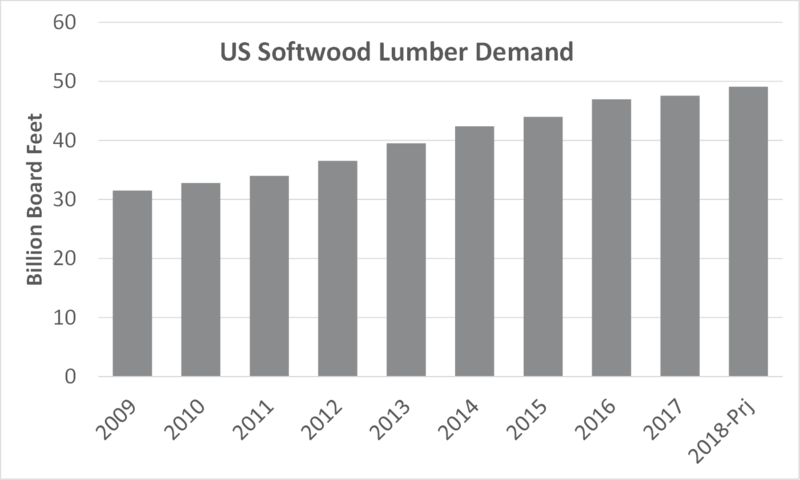 US consumers purchased just over 30 billion board feet (BBF) of lumber in 2009 and, while numbers are preliminary, we project that number will be roughly 49 BBF in 2018. In the US South in particular, a strange thing happened as lumber demand disappeared almost overnight: While timberland owners waited for a recovery, trees grew larger and larger and southern sawmills—owing to their new-found efficiency—simply learned to do more with less tree volume. The net effect of this trend after 10 years? Southern forests have more trees that are larger in size, and sawtimber prices in the region are virtually unchanged since 2007. As a result, capital investment has been pouring into the US South for one primary reason: cheap log costs. In fact, southern logs are some of the cheapest on the global market when compared to other major forest economies. But unlike those other wood basins, southern timber comes with a number of added perks that most simply cannot compete with, including efficient supply chain components from forest to mill, well-developed transportation and infrastructure solutions, robust rural forest communities, deep, competitive labor pools and healthy manufacturer margins. There has also been minimal volatility in southern timber prices since the Great Recession; only Brazil offers lower delivered prices. Forest products companies that operate in the South can take advantage of some of the lowest operating costs in the world with almost zero price risk on their largest input cost. There are signs that things are beginning to change, however. 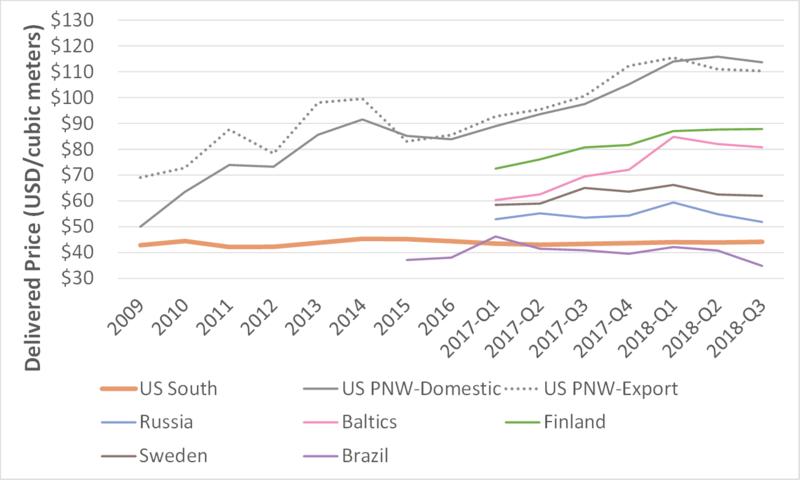 In 4Q2018, the price of sawtimber delivered to mills in the US South crept higher, as did stumpage prices. With a decade of flat performance in the South, why do landowners continue to grow trees? The reality is that returns are still good for timberland and timber revenue. Timberland owners have learned in this most recent cycle to keep expenses in check while making their acres more productive. 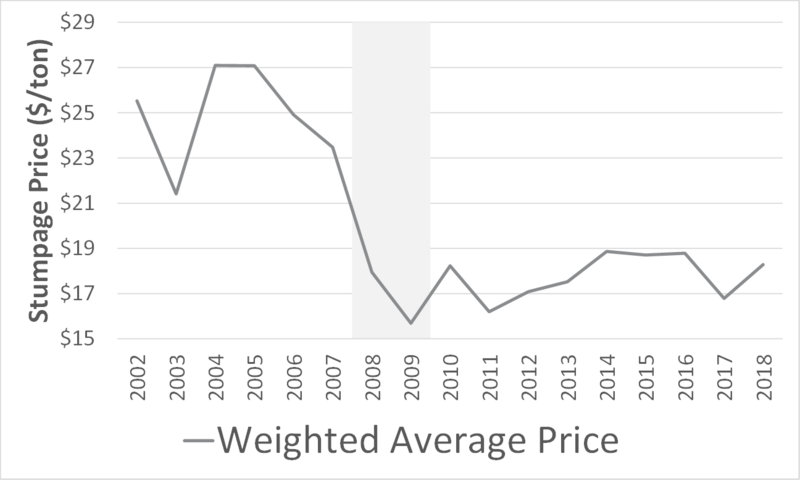 In fact, since 2009, the weighted average price of all timber products sold continues to increase. But like housing starts, the rally has not been as swift or as significant as many had planned for, and the details in the data tell us more. 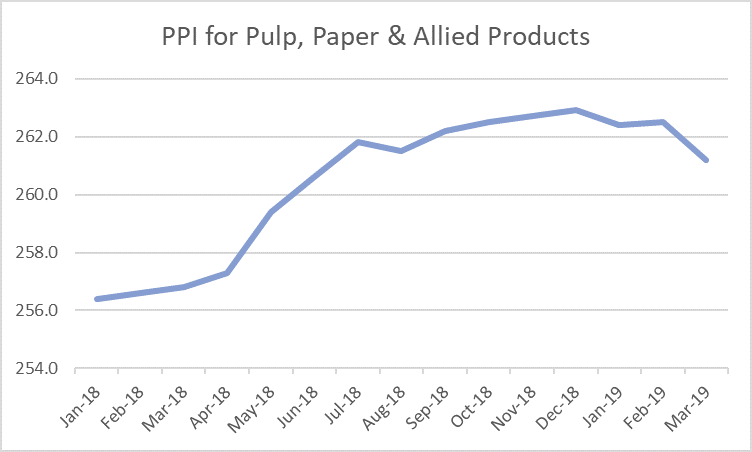 The largest driver of the price increase since 2009 has been pulpwood, as demand for this product continues to grow. Industrial wood pellets, containerboard and fluff pulp are very solid markets, and OSB has remained steady as housing slowly improves. 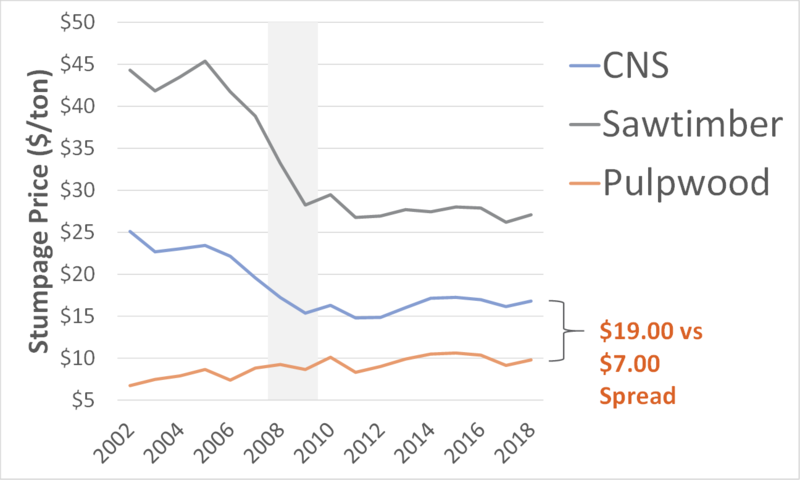 It’s also interesting to note that the spread between pulpwood and CNS continues to shrink. In 2002, there was a $19/ton difference; that gap has now closed to $7.00/ton. Southern landowners are getting better each year at increasing production and cash flow, and we will likely continue to see planting density increase and the rotation age shorten. On a Southwide basis, the days of mid-$40/ton stumpage for sawtimber and mid-$20/ton for CNS are likely gone for now. However, there are local pockets where current stumpage prices for large sawtimber are in the range of $40/ton. With world-class resources, low costs and the capabilities to manufacture and market a myriad of wood products, the US South will remain the land of forest products opportunities for the foreseeable future.